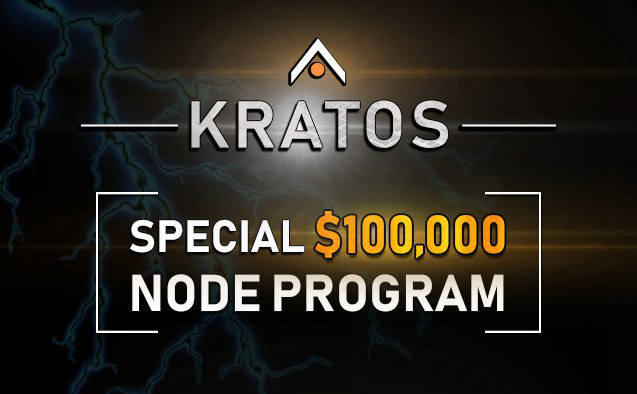 Mainnet is approaching, and thus it is time to introduce our main Node Rewards Program “KRATOS”. In appreciation of all token holders — and as a small taste of what’s to come once the ecosystem starts to flourish, APEX Network will be rewarding all token holders commanding at least a Data Cloud Node (>20k CPX). This is a significant expansion of the reach of the reward program compared to the original outline in the original Node Ecosystem Overview. Based on recent token statistics, the KRATOS reward pool has an estimated worth of more than $100,000! We launched our preliminary program last autumn — a three wave program with generous rewards that was met with appreciation by CPX holders. A lot of time has passed since then, and given that our mainnet launch is just around the corner, we have revisited the metrics for the KRATOS program and have decided to significantly increase the reward pool. One significant difference between KRATOS and the preliminary program is that every single CPX will count towards the rewards earned. We are thus introducing you to the weighted rewards that you will experience when voter node staking goes live. For every additional CPX, there is an increased reward. The program will run for a period of three months, with rewards being earned during the first three, and distribution happening during the fourth. Detailed terms and conditions to be found below — please read carefully. 1. There will be two snapshots taken during each of the months of May, June and July. The first snapshot will happen at some point during the 1st to 15th of the month, while the second will happen during the 16th to 30th/31st of the month. 2. The snapshots will be unannounced, and will happen at random times within the intervals specified to disincentivize price manipulation around snapshots. 3. The average wallet balance from the two monthly snapshots will count towards that month’s rewards. 4. If the average wallet balance of a subsequent month is lower than the wallet balance of the previous month(s), the balance of the previous month(s) will be adjusted to this new value — resulting in lower rewards. 5. During the month of August, there will be a final unannounced snapshot to confirm the balance of the wallets holding CPX. The result of this snapshot will follow the rules set out in 4). This means that a token holder who exits his position before this snapshot is done, forfeits his accumulated rewards. The program is designed to reward those who are aligned with the long term vision of APEX Network, hence the measures to disincentivize speculation / manipulation around snapshots. No snapshot dates will be announced until after reward distribution has taken place. In case of disputes, the right to final decisions lie with APEX Network. Accumulated rewards will be distributed no later than August 30th. Blockchain Powering the Next Generation of Consumer Applications. Backed by APEX Technologies.